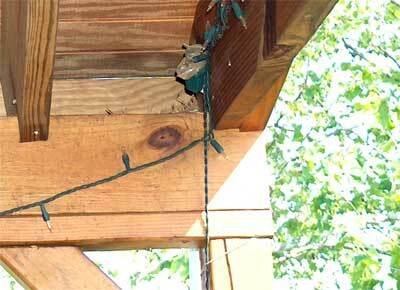 House Sparrows drove this bluebird from nestboxes, and she built a nest in the rafters of a covered deck.The depth of the rafter area is about 8". Photo by Bill Ebert of Leesburg, VA. There are occasional reports of them nesting in hanging baskets (although these are often Robin nests), Topsy Turvy Tomato plant containers, old cliff/barn swallow nests, ledges of porches, and metal pipes when nestboxes or cavities are not available. 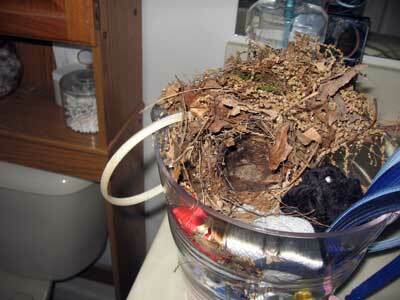 See photos of a nest in a clay pot at the same location. Carolina Chickadees are nesting in the 2" inside diameter steel pipe that this street sign is mounted on. Their nest started above the second bolt (26.5" down) and the top is 13.5" down from the opening at the top of the pipe. 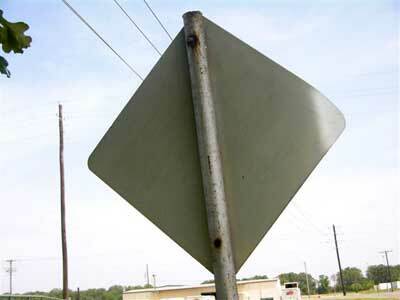 They have to squeeze by a 5/16" diameter bolt that holds the sign to the pipe. Photo by Keith Kridler of TX. More Carolina Chickadee nest photos. 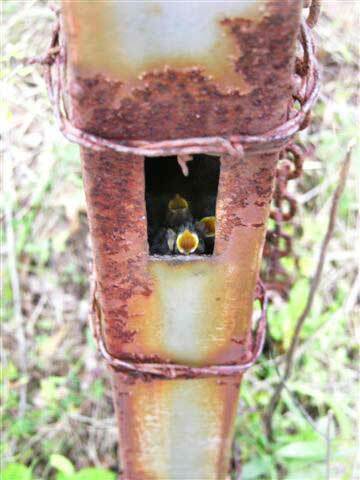 Black-capped Chickadees nestlings in TX in a Natural Steel gate post. Photo by Keith Kridler. Chickadees have also been known to nest in rotted wooden fence posts and open stumps. More Black-capped Chickadee nest photos. 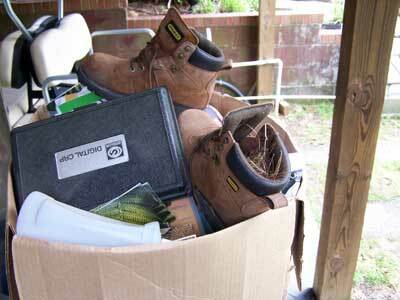 Carolina Wren nest in a boot out under a porch. Photo by Bet Zimmerman in NC. More Carolina Wren nest photos. Karen Ouimet of CT left her bathroom window open one day... and came home to a Carolina Wren nest in a container used to hold her hair scrunchies (on the top of the wooden cabinet.) She is leaving the window open for them. It is the only bathroom in the house, but they don't seem to mind her showering, flushing the toilet, or even blow drying her hair three feet away. Bluebird n ests inside electrical Square D breaker panels. 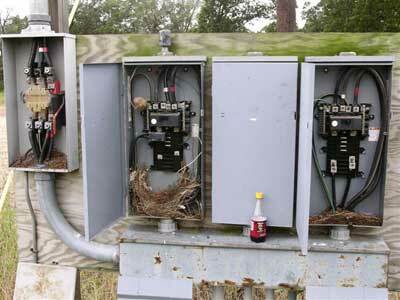 Each of the open doors had at least one breaker missing, creating a large nestbox. Three that were open to the weather had nests. One was an old Starling nest. 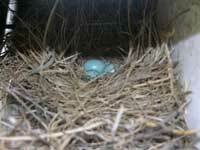 The other two were probably old bluebird nests. Photo by Keith Kridler of TX. Two bluebird pairs raised young in 55 gallon trash barrels right in the middle of the stations at a shooting range used on weekends. The bluebirds were nesting in empty shotgun shell boxes surrounded by empty shot shells down in the barrels. 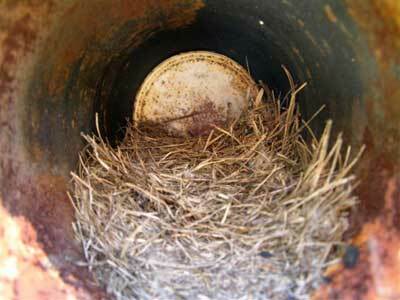 Keith Kridler has seen bluebirds and titmice both nest in this 6" interior diameter pipe. The nest in the photo is 17" away from the end of the pipe. 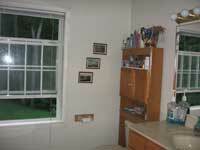 In 2007 it was occupied by a Black Widow spider. 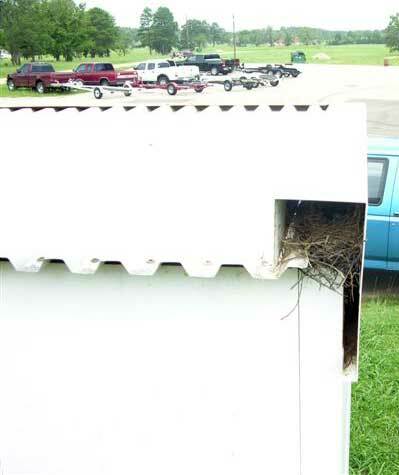 House Finches don't often nest in nestboxes. But they have used a wreath more than once. Photo by Bob and Kim Wolfe of Georgia. 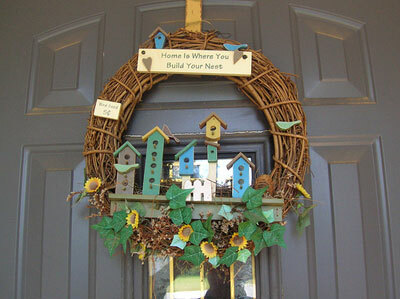 This one is particularly funny because the wreath says "Home is where you build your nest." Note the nest in the back of the little birdhouses. Four House Finches grew up in it. Eastern Bluebirds nesting in an opening in a metal building that is 4.5" tall by 5.5" wide. Photos by Keith Kridler. There are 21 nestboxes up in this park, with six other pairs of bluebirds nesting, but they still chose this spot. This (Titmouse?) 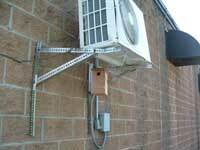 nest was built in the fan of an industrial air conditioner. 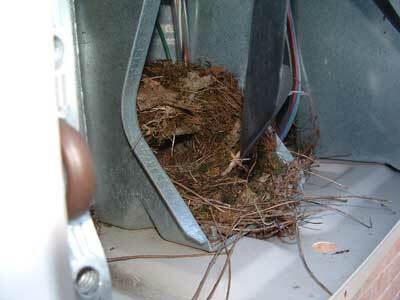 The occupants would have been struck by the fan blades when it was on, so it was moved to a nestbox that was strapped to the the air conditioner, but unfortunately it was abandoned, even though it contained 5 eggs. Titmice are not tolerant of nest site disturbance. Photo by Chris Asmann. To many the bluebird is the favorite of all birds. It is one of the most domesticated of our wild birds and readily takes possession of boxes erected for its accommodation or builds its nest in the crannies about farm buildings. Last updated July 17, 2017. Design by Chimalis.